Protection is the translation of the Russian word Pokrov. 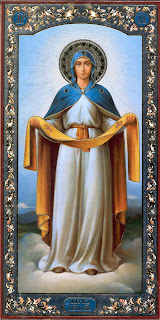 In this icon, the Mother of God is seen as the protector and intercessor of all mankind. The iconography of the Pokrov icon dates back to a tenth century miracle that occurred in Constantinople. Every Friday there was a ceremony of the rite of lifting of the veil covering the image of the Mother of God. At one of these services, St. Andrew observed Mary offering a prayer and spreading her cloak over the congregation as a symbol of protection of the people and city from enemy attack. The full length figure of the Mother of God is always central in this icon with the Virgin holding the veil sheltering all suffering mankind. For many centuries, Russians have believed that if they had the Pokrov icon in their homes they would have protection from earthquakes, plagues, fire, and other calamities. A sixteenth century Pokrov church on the Nerl River in Vladimir is used as the logo of the Museum of Russian Icons. Vladimir was the former capital city of Russia during medieval times. You have a terrific blog. I enjoy coming here to read. I saw you mentioned on Heather's blog and thought I'd stop by to say hello. Congratulations on your award. Nice to meet you, I've enjoyed my visit to Russia.